Photo by sjgardiner from the Torontoist Flickr Pool. The love a father has for his child is not something that normally begs any explanation, but when Brian Burke found himself twice thrust into the arena of accidental activism—the second time so tragically—he needed to speak out, at the very least, to draw a line in the sand. Burke made it publicly clear that his gay son not only had his family’s full support, but deserved honour and respect. By marching in yesterday’s Pride Parade in memory of his son, Burke demanded it. At the moment a child musters up the bravery to come out, a complicated process begins with the family. Suddenly, the ostracizing effects of homophobia extend to the parent, who is often forced to confront their own feelings of embarrassment and confusion, and who may now be subject to judgmental whispers and cutting diatribes themselves. For a parent, homophobia also carries the insidious suggestion that their parenting has failed—and to the religious, the notion that supporting a gay child is an affront to God. 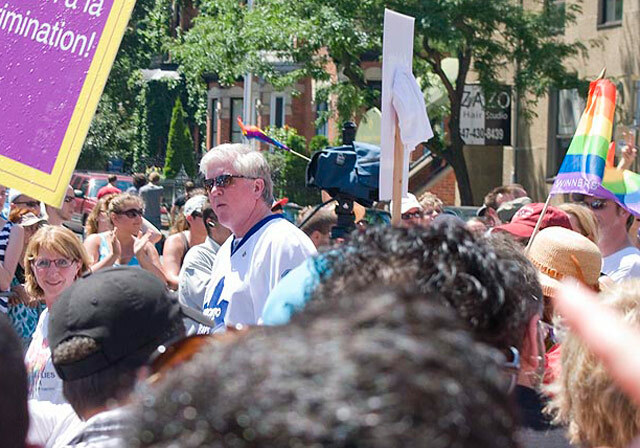 For Brian Burke, marching under a rainbow flag in front of hundreds of thousands of Torontonians was not a tableau he’d have foreseen years ago, but for some observers, it will define his legacy more importantly than his career in professional sports. His visibility as a PFLAG dad reverberates through families reconciling a child’s coming out, especially those parents struggling under the grip of cultural or religious condemnation. It affirms that love is paramount and that a network of support is available. It also shows gay people that acceptance from their families may be possible. During the parade, PFLAG was hailed with applause from the sidelines, but Burke likely wasn’t aware of how significantly the cheering swelled as they passed. This remarkable response from the crowd is laced with a history of familial pain, but more importantly, healing and honour. Though Burke is used to publicity when it comes to his career, he understandably seems uncomfortable with the activist role he’s assumed since Brendan’s death: this certainly was not an area of expertise, but of course you don’t abandon your son. How could anyone possibly believe otherwise? But they do, and that’s why he marched. This year, he and Brendan planned to walk side-by-side, proud father and son. As a PFLAG tale, the Burke family’s shared coming-out process was not particularly unique. As a eulogy, however, Brian Burke continues to distinguish his son’s short but powerful life with a force that Brendan could never have imagined. And because of their story, some terrified little boy somewhere is going to find the strength to tell his hockey dad a gut-wrenching secret, and that dad is going to tell his son that it’s okay, and that he is loved.